Born in the town of Mymensingh in Bangladesh, Shri Anirvan (1896—1978) knew the Astadhyayi of Panini by heart and daily recited a chapter from the Gita by the time he was eleven years of age. After completing his studies, he took sannyasa and became Nirvanananda Saraswati. Later he dropped the ochre robes and changed his name to Anirvan. His first book was a Bengali translation of Sri Aurobindo’s The Life Divine though the centre of his studies was the Vedas on which he had acquired a rare mastery. He is best known for his Veda Mimamsa which was published in three volumes. Kena Upanisad consists of the four sections of the fourth chapter of the Jaiminīya Brāhmana Upanisad of the Sāmaveda. It begins directly with Brahman as its subject matter and tells us in first two parts how it is impossible to know or attain Brahman by our ordinary senses including mind. To realize Brahman we have to open ourselves to higher intuitive levels of mind. In the third and fourth parts, the Upanisad beautifully speaks about the unknowable Brahman and about the subjective and objective ways of its realization through an allegorical story about Gods led by Indra on one side and Yaksha and Umā Haimvatī on the other. Brahman has to be meditated upon and realized as “Tad Vanam”—“That most Delightful Dear One”. Two reviews of Anirvan’s Kena Upanisad (distributed by Overman Foundation) penned by Sumita Bhattacharya have been uploaded in the online forum of Overman Foundation. 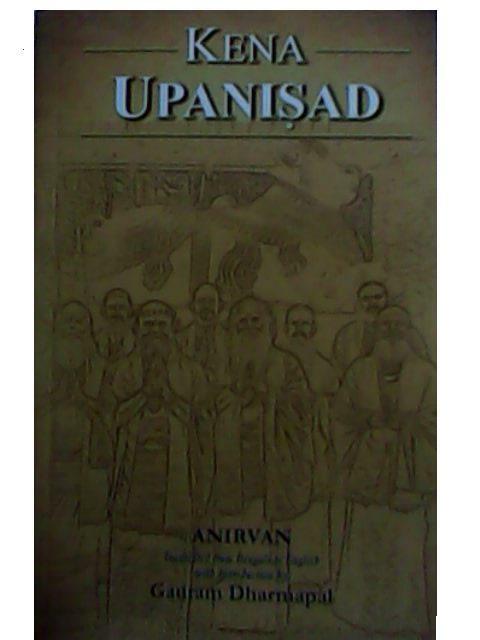 Kena Upanisad: Author: Anirvan; translated into English from Bengali by Gautam Dharmapal. Number of pages: 246. Price: Rs. 225. ISBN 978–81–88643-40-0. Distributor: Overman Foundation, Kolkata. A few questions from an inquisitive antevasi (resident learner in an asrama) to his vedavid acarya, marks the beginning of Kena Upanisad. His query was: “Propelled by whom the mind is directed to its object? Yoked by whom the first prana moved forward on its path? Impelled by whom is this word that speaks? Who is the god that directs the eye and the ear to their workings?” These lines are from Kena Upanisad translated into English by Gautam Dharmapal from the original Bangla [Bengali] text authored by Srimat Anirvan. Anirvan gave a series of talks on Upanisads in Bangla at Keyatala Road, Kolkata at Gautam and Gauri Dharmapal’s former residence. These talks later formed the basis of publication of a series by Burdwan University captioned Upanisad Prasanga (1966—2011). Three volumes, Isa, Aitareya and Kena were completed by Anirvan during his lifetime. From the copious notes taken by him, Gautam Dharmapal later compiled four more volumes and these too were published in the same series. In all, seven volumes have been published in Upanisad Prasanga series. It has been a happy idea to launch the translation of these highly valuable volumes into English from Bangla. Fortunately the responsibility of translating has been undertaken by Gautam Dharmapal himself. There could hardly have been a more capable person to do the work. The present work constitutes the first volume of the projected series of publication of the English translation of the entire Upanisad Prasanga series from Bangla under the caption Anirvan Upanisad Series. The book marks a happy beginning of what for sure is going to be an endeavour of immense value. As the Upanisad opens with the expression kena, it has acquired the name Kena Upanisad. Vedic literature values quest of timeless truth. In Kena Upanisad this quest for eternal reality finds an eloquent expression, Kena Upanisad belongs to Jaiminiya Upanisad that is again a part of Jaiminiya Brahmana of Samaveda. Four sections of the fourth chapter of Jaiminiya Upanisad forms Kena Upanisad. Kena Upanisad has a question-answer format. Its first two parts are in poetry. Mainly expounding Brahmavidya, the text is divided into four sections. First section deals with the inadequacy of sense perceptions to know Brahman. Second section argues that Brahman, however, is knowable; it lets itself be known through reflective perception (pratibodha). The third section elaborates the knowable-unknowable character and the mystique of Brahman through an allegorical tale. Section four deals with the reality of Brahman, its attributes and the disciplines required, including rituals, for attaining it. Kena Upanisad is the gist of the mystic teachings of Jaiminiya Upanisad. So, Kena Upanisad has to be read against the background of Jaiminiya Brahmana Upanisad, of which it is a part and shares the latter’s mystic underpinnings. Brahman presented in Kena Upanisad is the Para-Brahman; its foundation is Sabda-Brahman. One gets a clue to this in the way Kena Upanisad has been placed in Jaiminiya Upanisad. Its placing in between the mystic interpretation of the Gayatra and Savitri samans suggests that Kena Upanisad marks the culmination of samopasana (meditative contemplation of saman), holds Anirvan. While Jaiminiya Upanisad is now obsolete, Kena is still in vogue. Kena has greater clarity and is more compact. Like other Upanisads, Kena too begins with santipatha. Santipatha, according to Anirvan, signifies much more than a mere benedictory invocation; it sets the tone and tenor of the text embodying the very spirit of it. It is thus imperative to understand the defining character of each santipatha found in various texts to understand the text itself. The defining character of santipatha in Kena is apyayana (nourishing care): harmonious apyayana of all the limbs of the body and prana and of the self. Since the text is a dialogue between the seeker pupil and the teacher, apyayana prayed for in the santipatha is for the seeker. Thus the mystic spiritual character of the text has already been adumbrated in the santipatha itself. The strengthening of all the sense organs that the santipatha speaks about is in line with the Vedic philosophy of direct luminous perception, says Anirvan. It may be added here that a cardinal principle of Anirvan’s interpretation of Vedic texts is that he considers these texts as enshrining various ways and principles of spiritual practice or sadhana. In Anirvan’s view then a particular mode of sadhana lies at the core of Kena Upanisad and the santipatha is a condensed statement of that mode. It is that mode which has been clarified and elaborated by Anirvan in the present work. The essence of all Upanisadic sadhana, as is well known, is the quest of Brahman. A person (purusa) is a combination of body, senses and consciousness; all these are interdependent. Sadhana cannot afford to ignore any of them. Thus body is the first instrument of attaining Brahman; it is the starting point, as it were, of the journey towards Brahman realization. The pursuit, however, has to move forward in stages; from the body to senses, from senses to illumination (prajna), gradually to the mystic realization of the vibrations of the void (akasa) in one’s own being, and finally to the merger of the subjective prana to the Mahaprana. The movement forward is also one of progressive purification; the purification of body, of senses, of consciousness; indeed of the entire being of oneself. The light of the inner being shines in the physical body through purification of the body, the light of consciousness shines in the senses through purification of the senses, and so on. The objective outward seeing progressively has to be turned into subjective inward seeing; by the inner seeing both the reality of the inner self as well as that of the divine (or Brahman) reality can be seen. Kena Upanisad mode of sadhana emphasizes the importance of the simultaneous and harmonious nourishment (sarvata bhadra apyayana) of all aspects of the being of the seeker. “Let my two ears and eyes fly onwards; may this light, that is imbedded in my heart, move forward; my mind moves towards distant ideas; what should I say, what should I think about.” In Vedic discipline, eyes and ears go together; between them there is consciousness; first comes seeing, then hearing; explains Anirvan. Kena Upanisad talks about three entities closely connected with Brahman which are: akasa (supreme void), vidyut (lightning/illumination) and Indra (prathamo manasvan, the pristine mind). The first is Brahman’s abode, the second is its indication, and the third is the one who is endowed with the capacity to know Brahman. In the tale about Yaksa in Kena we find that when Yaksa is not visible, only the void, the mystic nothingness remains. As akasa is Haimavati’s resort as well and as Indra, the seeker moves about there in his quest, akasa thus is the upholder of all the three. The sudden flash of lightning in akasa is an indicator of Brahman. Indra, however, does not remain confined to the celestial sphere alone, but becomes manifested in the universe at large. Akasa nonetheless remains the all enveloping space holding Yaksa, Haimavati and Indra. To explain Brahman, each Upanisad uses a seed-like phrase called Mahavakya, a great saying. The distinctive Mahavakya in Kena is Tad Vanam. It suggests that Brahman is bliss-delight, the dearly loved ‘That One’. Shimmering in the melody of saman of the universe (i.e., the harmony) Parabrahman enters our being infusing in us serene bliss (soumya ananda). This happens when a seeker—with unsullied mind, purified by tapa, karma, dama and is enlightened through pratibodha and yearns for Brahman—is divinized by divine influx in him. Then His grace rains down on that ardent aspiring seeker. The truth then dawns on the seeker and the seeker then partakes of the bliss that is Brahman/Yaksa. There are different stages of this realization, different modes of savoring this bliss, different ways of achieving this. These have been detailed by Anirvan with feeling and sensitivity over the four main chapters of the book. Two of these features deserve special attention. Firstly, even the finest intellectual apparatus is not enough for Brahman realization; the intellect has to be leavened by the purity of yearning (abhipsa) and illumination (bodhi). This too has to be supported in its turn by the grace of the divine. But the grace is not capricious; steadfast yearning of an unsullied mind, almost inevitably, attracts grace. Secondly, Brahman can be realized in this very life. These two features give Kena its distinctive character. The volume is a treasure house for all serious students of Vedic literature. It bristles with ideas and insights that would interest scholars of philosophy and religion. But perhaps more than academics, scholars and intellectuals, those who have not still lost faith in the possibility of practicing and pursuing paths of spiritual fulfillment will find the volume of absorbing interest. Anirvan’s treatment of Upanisads, not just Kena alone but all of them, foregrounds the spiritual religious character of the texts besides their obvious value as examples of exalted speculative philosophy which won them a host of admirers, Schopenhauer being an oft quoted example. In the Upanisad Prasanga Series, Anirvan carries forward the sumptuous fare he had already offered in his masterly Veda Mimamsa volumes. Anirvan is a supremely gifted writer who could combine with enviable felicity the rigor of philosophy and the sensitivity of literature. His Bangla prose is highly poetic and elegant; and his discussions brim with allusions and idioms of Indian philosophical tradition. His Bangla works thus do not lend themselves easily to translation in English. To render an accurate, easy flowing English translation of Anirvan’s Bangla demands Herculean power and effort. It is a measure of Gautam Dharmapal’s proficiency that he has achieved these ends with consummate adroitness. The profundity of Anirvan’s deliberations has been translated into a language so serene and lucid that it has acquired a lyrical quality of its own. No amount of praise would be too high for such an excellent translation. On February 21, 1954, three brilliant minds met in Kolkata, as if by divine ordain, and a close bond was established among the three devoted to carrying forward the legacy of India’s spiritual philosophy. Since that meeting, one of the trio, a luminary known as Anirvan (a great Vedic scholar and mystic poet-philosopher) became the spiritual preceptor as well as ‘Friend and Father’ to the other two, Gautam and Gauri Dharmapal (eminent scholar couple dedicated to the pursuit of knowledge). It is at the Kolkata residence of the Dharmapals where Anirvan too had shifted later that he gave a series of illuminating talks on the Upanişads, the Ŗgveda and the Bhāgavata. Shri Gautam Dharmapal diligently took detailed notes of these talks. These were later published as seven-volume Upanişad Prasanga series by the Sanskrit Department, Burdwan University (1999—2011). Three among them were overseen by Anirvan himself during his life time; the other four were later compiled by Shri Gautam Dharmapal. The Dharmapals took utmost care of Shri Anirvan during the last seven years of his life as he became immobilized because of an accidental fall leading to paraplegia. Even in that condition, Anirvan continued his role as a teacher ever alert and cheerful as he was always. Thus it was a significant meeting as three likeminded people joined in the regeneration of India’s spiritual heritage at a time when great prejudices and misconceptions prevailed about this in the minds of many Indians. The present book constitutes the first volume of the projected series of publication of the English translation of the entire Upanişad Prasanga series from Bangla under the caption Anirvan Upanisad Series. The book marks a happy beginning of what for sure is going to be an endeavor of immense value. Anirvan’s amazing erudition indeed has found a true match in Gautam Dharmapal’s brilliant translation. While dealing with the text Kena Upanişad, Anirvan notes that the original Sanskrit text of Kena Upanişad, is set in question answer format between an antevāsī (resident pupil in an āśrama) and his ācārya. The aspirant learner seeks answers to his queries about the nature of the Absolute and the ways to attain it. By stages the ācārya illumines how Parābrahman is the supreme reality and the ways to attain It. The book is one of the examples of how Vedic literature values quest. An exquisite introductory poem by Uma Gouri at the beginning of Dharmapal’s translation tells us “Yāska, Brahman in mystique Form is the most venerable secret quest” and then it says further: “Tad-Vanam is the Answer. The sweetest Personal Love…” The poem lets us know “Kena is the psalm of Umā Haimavatī, … the golden perennial flow of Light … was the dream and aspiration of Anirvan”. This explains why the translation of Kena Upanişad been taken first in Anirvan Upanişad series. The poem also sums up the main quest as well as the answer of the guru to the ardent seeking as has been unveiled in Kena Upanişad. That this poem has been placed at the very outset is an apt and novel idea. In the beginning of the text the ācārya explains to the student why and how the Brahman cannot be realized by logic or analysis, by this or that empirical method (neti neti). However, a purified soul endowed with austerity, karmas and self control (the three means of sādhanā) can realize Brahman by reflective perception (through a flash of intuition or spiritual light pratibodha, which reveals and thus enlightens). The ācārya then says, “You should also worship tat (That) as ‘vanam’ as the most dear One —as the material cause of the creation and as the supreme goal”…“One who revels in this ‘vana’—love or brahmānanda—Bliss of Brahma, is the uttama puruşa…” Such a uttama puruşa is the product of gradual cleansing of all sense organs, mind and soul and he thus is able to see the inner self by inward eyes. ‘Remaining joyful within’ he moves through the course of everyday life, his body in total harmony with the rhythm of the fundamental reality of the universe like the sāman melody. Inspired by that melody a seeker’s mind yearns for Brahman whose essence is bliss and love. Through the inspiration and impelling of Brahman, the aspirant’s mind enlightened by pratibodha realizes the eternal infinite Brahman or Truth. As truth enters his being, there is illumination in the sky of his consciousness and the aspirant merges with the Brahman. Brahman too then resides in that awakened soul. As the text ends, Anirvan tells us that the teacher fell silent, as he has told all that there was to tell; the taught too “was silent … as the teacher’s power was descending on him”. It is noteworthy that a few distinct features at once mark out Anirvan’s interpretation of Upanişads. But before taking them up it is necessary to bear in mind that his interpretation of Upanişads is only a continuation of his interpretation of the Mantras that he dealt with in his masterly three volume study under the title Vedamimamsa. Anirvan stoutly contests the contention of modern Vedic scholars that from the Saṃhitās to the Upanişads there is an evolution from the primitive to the refined, a gradual development of intellectual understanding of the nature and the world on the part of the Vedic authors. Anirvan shows that the entire Vedic literature is an embodiment of profound spiritual experiences and it remains the same over its four divisions, Saṃhitā, Brāhmaŋa, Ārŋayaka and Upanişad. Only the manner and media of expression change: “The experience that is intuitive in the Mantra portion, is elucidated rationally or intelligently in the Upanişads”. But Upanişad is not just philosophy in ordinary sense, it is not just refined intellectual arguments for the clarification of some concepts; Upanişad is an articulation of spiritual experience. A second feature of Anirvan’s viewpoint is that all Upanişads basically say the same thing. Thus in his exposition of Kena, Anirvan keeps on referring to various other Upanişads. He argues his case with copious references to original texts, his range is awesome; his command over the material is sure and faultless. And above all, his interpretations have been leavened by his own spiritual experience to give his interpretations a rare authenticity. These characteristics are obvious in the present work as well. The essence of the text that is pervaded with mysticism has found a profound exposition through Anirvan’s luminous insight and deep knowledge. Anirvan’s language—chaste and classical—his thought and analysis that has found a sonorous and eloquent expression in his interpretation have been translated with equal felicity, grace and beauty, by Dharmapal. The translation reads so smooth—its language so lucid and easy flowing that it has acquired a lyrical quality of its own. On reading it, one marvels: are the interpreter and translator the same? About the reviewer: Sumita Bhattacharya is a former Sub-editor and Assistant Quality Controller of The Northern India Patrika, Allahabad, former Sub-editor of Sundaram, a journal published by North Central Zone Cultural Centre, Allahabad and former Translator-Fellow of Indian Institute of Advanced Study, Shimla. Previous PostA Revolutionary Becomes a Saint: The Story of Sadguru Omkar. We cannot thank you enough for bringing this review of the work of Sri Anirvan so well translated by Sri Gautam Dharmapal, The reviewer has touched the mystic and subtle message in these works, one cannot wait to read the original. Thanks. Its amazing even to read a review, what a real work would be like !! !